While there are four bones that come together at the knee, only the femur (thigh bone) and the tibia (shin bone) form the joint itself. The head of the fibula (strut bone on the outside of the leg) provides some stability, and the patella (kneecap) helps with joint and muscle function. Movement and weight-bearing occur where the ends of the femur called the femoral condyles match up with the top flat surfaces of the tibia (tibial plateaus). The knee joint also includes the patello-femoral joint between the kneecap (patella) and the trochlea (groove) on the front of the femur. There are two major muscle groups that are balanced and allow movement of the knee joint. When the quadriceps muscles on the front of the thigh contract, the knee extends or straightens. The hamstring muscles on the back of the thigh flex or bend the knee when they contract. The muscles cross the knee joint and are attached to the tibia by tendons. 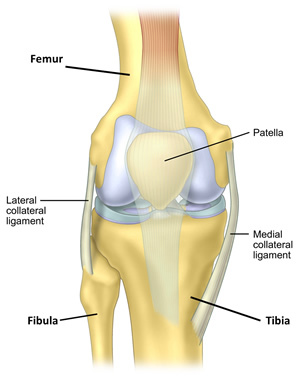 The quadriceps tendon is a little special, in that it contains the patella within it. The patella allows the quadriceps muscle/tendon unit to work more efficiently. This tendon is renamed the patellar tendon in the area below the kneecap to its attachment to the tibia. The stability of the knee joint is maintained by four ligaments, thick bands of tissue that stabilize the joint. The medial collateral ligament (MCL) and lateral collateral ligament (LCL) are on the sides of the knee and prevent the joint from sliding sideways. The anterior cruciate ligament (ACL) and posterior cruciate ligament (PCL) form an "X" on the inside of the knee and prevent the knee from sliding back and forth. These limitations on knee movement allow the knee to concentrate the forces of the muscles on flexion and extension. Ligaments can be likened to pieces of string whose purpose is to control and prevent excessive movement of joints and are made of strong connective tissue (collagen). Inside the knee, there are two shock-absorbing pieces of cartilage called menisci (singular meniscus) that sit on the top surface of the tibia. The menisci allow the femoral condyle to move on the tibial surface without friction, preventing the bones from rubbing on each other. Without the menisci, the friction of bone on bone would cause inflammation, or arthritis. There are two types of cartilage in the knee, articular cartilage and meniscal cartilage. The articular cartilage covers the surfaces of bones. It provides a strong resilient and extremely smooth surface to allow the bones to move over each other. There are two ‘C’ shaped meniscal cartilages, the medial and lateral cartilage located between the femur and tibia on the inside and outside of the knee respectively. They have a number of important functions including shock absorbtion, lubrication, proprioception and stabilisation. However their most important function is as load distributers, converting a round (femur) on flat (tibia) bearing surface to a perfectly matched round on round bearing surface. When people talk about a 'torn cartilage', they typically mean the meniscal cartilage and not the articular cartilage. 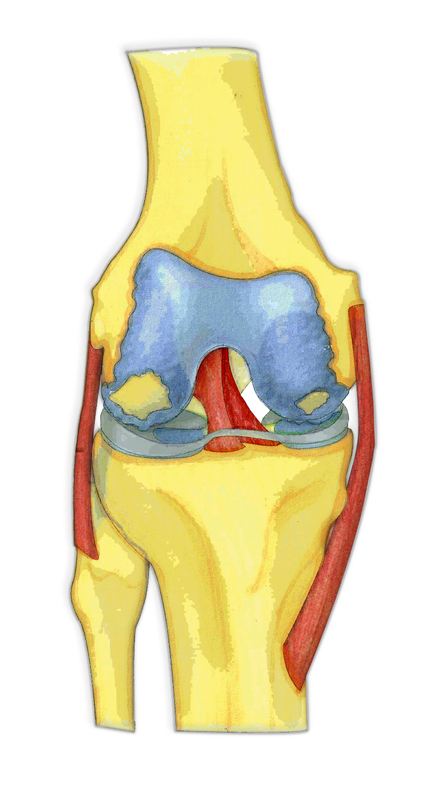 Bursas surround the knee joint and are fluid-filled sacs that cushion the knee during its range of motion. In the front of the knee, there is a bursa between the skin and the kneecap called the prepatellar bursa and another above the kneecap called the suprapatellar bursa (supra=above). Bursae can become inflamed and inflammation of the prepatella bursa and the infrapatella bursa are called housemaid’s and clergyman’s knee.